I taught first-year writing courses at Emerson College during and after earning my Master’s degree in Publishing and Writing. Over the course of my three years teaching at Emerson, I taught several variations of the WR 101: Writing I (previously Introduction to College Writing) and WR 121: Research Writing. Below, you can find course descriptions and syllabi as well as samples of student work. WR 101 is the first in a two-course series at Emerson College. In previous years, the course has focused on academic writing projects in the style of Ken Bruffee’s A Short Course in Writing and tackled social issues. Fall 2015 is a pilot year in which the class is reimagined as an exploration of the essay as a genre—the course begins with the position essay, considers essays that challenge this structure, and builds toward multimodality. This complements the next sequence in the course WR 121. Both version of the course focus on collaborative learning techniques through peer review and revision as a major principle of writing. WR 121 is the second in the two-course series at Emerson. This is a themed, genre-based research writing course. The focus here is to further develop rhetorical awareness and to consider the life of pieces outside the classroom. The year culminates in the FYWP Annual Showcase of Student work. Visit Student Work to see final project produced by my classes. This class explored genre, audience-writer relationships, distribution of texts, and different modes of research through the lens of magazines. Over the course of the semester, students created content for a class magazine about life in Boston. Each assignment (review, profile, academic research paper) encouraged students to engage with the city on various levels and through different forms of research. The culminating assignment was the production of print and digital editions of the magazine for presentation at the FYWP Annual Showcase. This service learning course will answer the question: What does it mean to be literate as a person, as an academic and student, and as a member of our community? In writing projects, students will work in various genres, such as literacy narratives, research guides, letter writing, proposals, and media campaigns, to address an array of rhetorical situations. In community literacy projects, you might find yourself creating a media campaign for a literacy organization, tutoring local students in writing and reading, or working with seniors to record their stories, among other things. Community partners include Writers Without Margins, 826 Boston, and Hale House. At Emerson College, one of the goals is to consider how writing can have impacts outside the classroom. As such, the courses are often focused toward students engaging with real world issues and creating texts for the general public. One facet of that is the FYWP Annual Showcase of Student Work, which I co-chair. Below, you will find information about the Showcase as well as links to projects that were created by students in my classes. The First-Year Writing Program Annual Showcase of Student Work serves as a platform for students to publicly share and celebrate their year-long study of writing and intellectual inquiry through the collaborations, research, and multimodal projects produced during their time in the FYWP courses. For two years, I served as co-chair of the Showcase Committee and helped coordinate the event with fellow instructors, a committee of students, and various academic and non-academic departments in an effort to promote student intellectual engagement through multimodal presentations and panels. Using the skills we’ve learned from professionals in the magazine industry, we’ve created a magazine that focuses on a wide range of topics that relate to students in Boston. Through reviews, profiles, and feature articles we cover everything from the Boston music scene to economic struggles to student life. We hope to update and inspire our peers about these relevant topics. 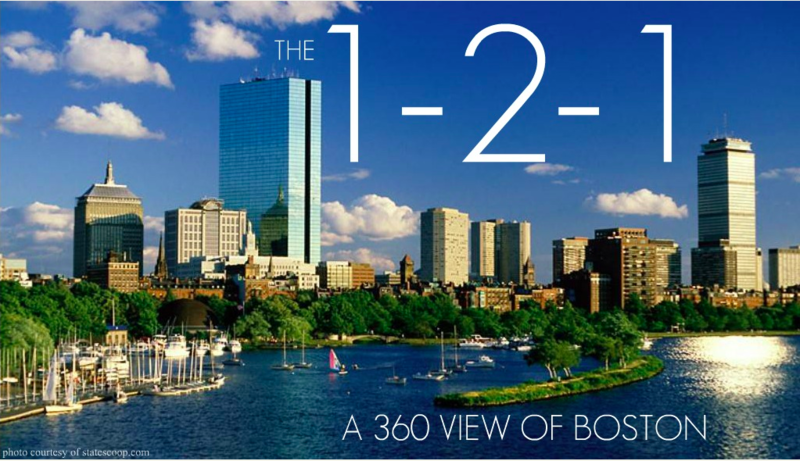 The 1-2-1 is a magazine curating works from Researching Writing class 121-27 focused on Boston as a city and society. The students of 121-27 have wrapped their brains around such pertinent issues as homelessness, high school dropout rates, and gentrification. Now their thoughts are presented here…for YOU! This is also the subject of my poster presentation “Literacy Narratives, Genre Awareness, and Knowledge Transfer: A Case Study” from 4C 2016. You can see more here and a selection of literacy narratives here. 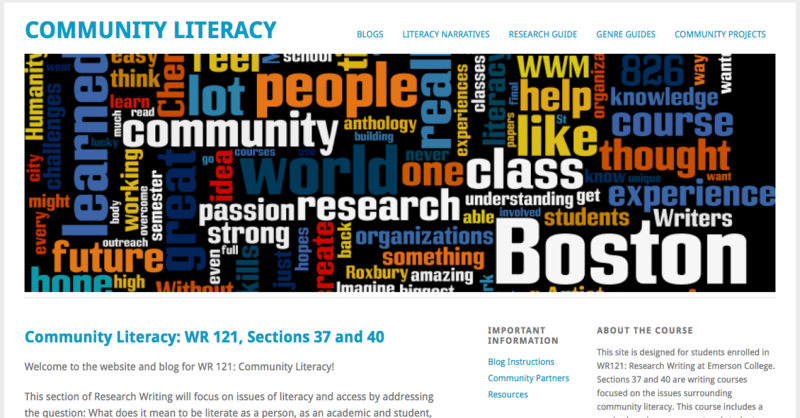 This website and blog represents the work from two service learning classes focused on community literacy. Students documented their learning and experiences working with the community through individual weekly blogs, literacy narratives, annotated bibliographies and multimodal final projects reflecting on their work with community partners.